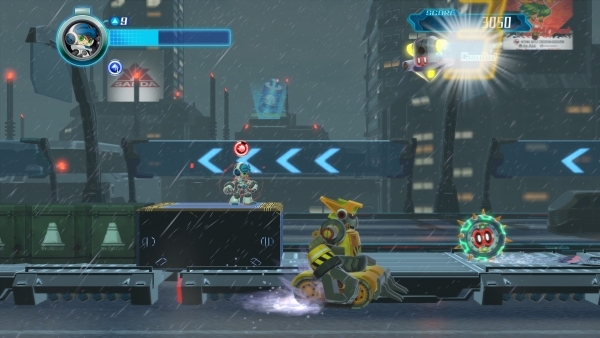 Keiji Inafune's Mega Man-esque side-scroller has gone gold. Mighty No. 9 has completed development and will launch for PlayStation 4, Xbox One, Wii U, PC, PlayStation 3, and Xbox 360 in North America on June 21 and worldwide on June 24, developer Comcept announced. Find a message from creator Keiji Inafune below. Portable versions for PlayStation Vita and Nintendo 3DS will follow at a later point. Now that the dust has settled, we will be delivering Mighty No. 9 to everyone next month. How long will it take you to clear the main story on NORMAL? How many people are going to be able to clear MANIAC mode? What is going to be the fastest record for the time attack mode? We are looking forward to seeing the community answer all of these questions for us! Make sure to let us know your feedback and thoughts on the game through our SNS channels as you play the game. Your voices are what made this game possible, and we want to continue hearing what you think so that it may influence our future endeavors.